each with its taste of matter and dust. in “New Baghdad” of my now lost city. with gentle people was ripped off. I trampled a desire of the now distant girl. or children, unknowingly, killing their father? an ancient photo in sepia. * New Baghdad: a Baghdad suburb. 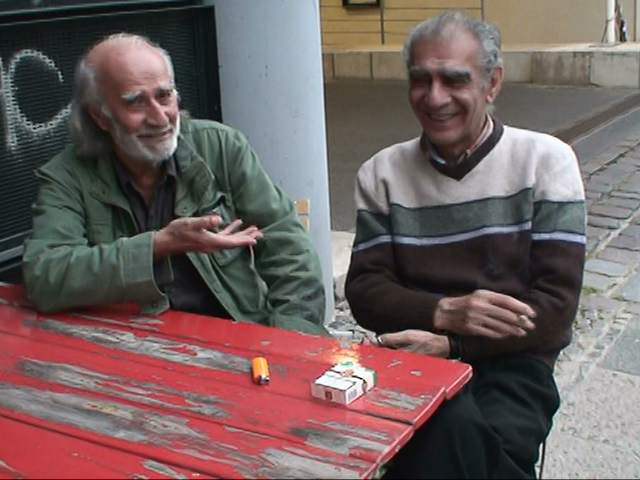 Iraqi poets Anwar Al-Ghassani (l.) Mouayed Al-Rawi (r.), and Sargon Boulus (on the opposite side of the red table), at our favorite Café Sociale in Berlin. We have been friends since our teenage years in Kirkuk. The days of our recent meeting in Berlin (July-August 2007) were, as always when we meet, days of light and warmth, humor and laughter, and lively conversations, rich in intellectual substance, creative ideas, experience and knowledge. For me, it was wonderful and an honor to be with my dears Mouayed and Sargon, two warm and intelligent personalities, two great poets. With the passing of the years, the bond that emerged at physical and mythical Kirkuk has grown in strength. Our friendship has become finer, warmer, richer and more elegant, imbedded in affinity, harmony, affection, sympathy and respect. Few things in life are so joyous, beautiful, amusing, intense and serene as the days when we meet. to have its own life, independent of me, the person who is writing it. The collection will be "writing itself"
until it has some 40-50 poems around December 2007, four months from now. That would be the point to finish this part 1 of this Book of Love And Veneration. No power in the world, not even me, can stop this collection from reaching its final destination. What happens after that? Will there be a Part 2 or a continuation? I don´t know. Writing & Editing Status: the collection was started on July 31, 2007, and will be completed around December 2007. Sample of Poems from the new collection "Book of Love and Veneration", currently in production process. With these poems, I am wandering out of time and abandoning, at least temporarily, the so-called "Hyperpoetry" and "Hypepoetry". In my attempt to express love and veneration for a pristine being, I am adopting a more lineal approach and returning to archaic forms of prayers and hymns, particularly those of my Mesopotamian ancestors. is my recovered breath and horizon. and brought me fields and trees. Irreversible, my attraction to you. I am a star maneuvering to land on your island. yet, there it is, the trace of blood we left behind. on my way to meet friends. hitting the hot dust of the road. of you being led to execution. Keep flowing, flowing, flowing in the tram. She will leave and much later come again. where plans are born and then decay. keep flowing in the tram. has a region of light. is disguising the day in its past. But at what places and times? not those of the risk taker. it sighted its abandoned home. to the creation of your garden. points, if separated, would vanish. the negation of our fusion. risked the outcome of contests. on the markets of estranged cities. We betted on total win or breakdown. We have escaped with our lives. Our next bet is not a gamble. From now on, we shall only bet on each other. you perceive a spot of light. That is me: the silence around you. My discourse is eloquent and soft. I am ready for forty days of seclusion. until we are one in union. I enter the region of silence. to produce life, robust and composed. of all what someday would decay. the love he had forgotten long ago. at this eroded bare landscape. had delegated it to ultimate stop. no interaction and no event. and for this landscape, our final home. I am lonely since your arrival. Visible now is the abyss. It may even restore health. Missing are your voice and words. the language of next meeting. left images, offset in gray. to retrieve us for each other. I maintain my soul joyous. and aspire to distant light. How can I recover your person? and hope we relive our infancy. Like breaths, lives emerge and end. Senseless beauty relating to death. A reminiscence of you equals life. land, green, leaves and sea. down where water is brought into life. prepared to consume our mutual inclination. Alas! No recording of the ancient event. giving pretext to the trees to excel and shine. as we were still in the cold. follows its trajectory to unite our hands. replicating all bygone times anew. upon itself, to stay limitlessly juvenile. 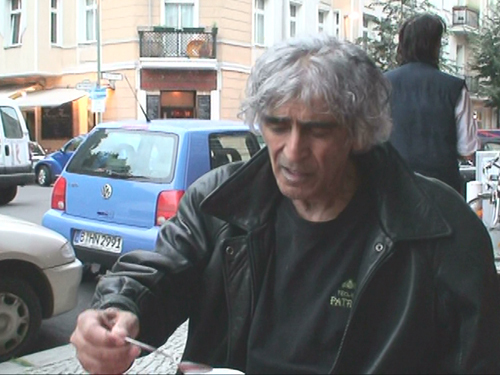 Right now, sitting at a Cafe with WLAN connection, in Berlin, in this unusual Berlin summer, I am living through a wonderful music hype with some classics of popular Egyptian music. I have just downloaded and I am listening to a masterpiece by Muhammad Abdul Mutalib, "Sakin Fi Hay el-Sayyeda" (Living at el-Sayyeda Neighbourhood) - a popular neighbourhood of Cairo.